In Trump presidency, would closer relation with Russia be personally profitable? Donald Trump and his children have for years promoted themselves and their real estate opportunities in Russia and other former Soviet states, and ethics experts say if he is elected President the get-tough U.S. sanctions against Russia could be in direct conflict with his business interests. But Richard Painter, a University of Minnesota law professor who served as ethics advisor to Republican President George W. Bush, said the arrangement would not fit his definition of a blind trust, and appeared ripe for potential conflicts. As questions have been raised about Trump’s business interests with Russians, the candidate has sought to distance himself from Moscow. “For the record, I have ZERO investments in Russia,” he wrote on Twitter in July. He later told ABC’s George Stephanopoulos, “Will I sell condos to Russians on occasion? Probably. I mean I do that. I have a lot of condos. I do that. But I have no relationship to Russia whatsoever." But an ABC News investigation found he has numerous connections to Russian interests both in the U.S. and abroad. Questions about Trump’s posture towards Russia have been a recurring issue in the 2016 presidential campaign. They have come from Democrats and Republicans, many of whom expressed surprise at Trump’s flattering remarks about Russian President Vladimir Putin, even as the official U.S. stance has grown increasingly frosty. 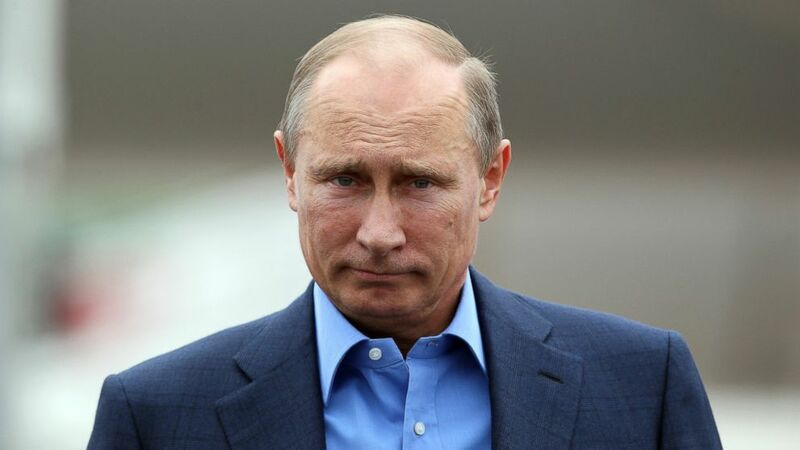 “I would treat Vladimir Putin firmly, but there’s nothing I can think of that I’d rather do than have Russia friendly as opposed to the way they are right now so that we can go and knock out ISIS together with other people and with other countries,” he said. (Peter Muhly - WPA Pool/Getty Images) Russian President Vladimir Putin arrives at Belfast International Airport on June 17, 2013 in Belfast, Northern Ireland. Sen. John McCain told a talk radio audience he was “astonished” after Trump praised Putin on the campaign trail. “I think [it] shows either profound ignorance or an attitude that contradicts everything about the United States of America and our relations with our adversaries,” McCain said. Long before he ran for president, Trump displayed an ongoing interest in Russia and the former Soviet states. He negotiated projects in the Republic of Georgia and Azerbaijan, neither of which was completed. And he and his children at different times toured Moscow in search of a site for a Trump project there. Trump was involved in a range of deals with Russian-born business executives, including the developer of the Trump project in Toronto. One of his partners in Trump Soho recruited financing from investors in Russia and Kazakhstan, according to court filings. And in 2013, Trump earned a cut of the proceeds when a Russian oligarch paid to host the Miss Universe Pageant at his venue in Moscow. (Alexander Nemonov/AFP/Getty Images) Miss Venezuela Gabriela Isler celebrates with her crown during the 2013 Miss Universe competition in Moscow on Nov. 9, 2013. At the same time, wealthy Russians accounted for significant profits at Trump projects in the U.S.. Throughout the 2000s, records show Russians were buying into Trump branded real estate. ABC News conducted a review of hundreds of pages of property records and found that Trump-branded developments catered to large numbers of Russian buyers. Trump Organization General Counsel Alan Garten told ABC News the firm does not track the nationality of buyers, but he does not believe Russians spent any more money on Trump ventures than those from other regions. “This whole fascination with this connection is overblown and misleading,” Garten said. Garten said the Trump Organization played no part in determining which market to pursue – the strategy used to attract buyers was entirely the purview of the developer. In the case of the Trump towers along Florida’s coast, they were sold by two separate builders with Trump licensing his name to the projects. But the licensing agreements required Trump to participate in the marketing of the condos, and Trump received royalties for each unit sold, according to Gil Dezer, president of Dezer Development, which built six Trump buildings in Sunny Isles. Dezer described Trump’s hands-on approach to the projects, with involvement in every detail of the construction. “He would come in and he knew exactly what he would want,” Dezer said. There is ample evidence in Russian media from that period in the 2000s that brokers mounted a significant effort to attract buyers to Trump properties in Florida, Toronto and New York. And Trump and his children participated in those campaigns. Eric Trump and Donald Jr. were also present, and were quoted praising the importance of Russian condo buyers, many of whom have purchased units in Trump buildings in seven-figure, cash-only deals. Garten said the Trump Organization did not fly Russian journalists to New York to tout the SoHo project, or any other. “If such a trip took place it would have likely been arranged by the developer or the broker for the project - not us,” he said. Victoria Shtainer, a New York real estate agent who specializes in the high-end market, said the interest from Russian buyers rose in the early 2000s as Russians started to accrue wealth and began looking for a safe place to move their money. Advertisements began appearing in Russian media. Real estate agents marketing Trump projects showed glossy photos of the Florida oceanfront properties, such as one licensed development called Trump Hollywood. But Pansky and Shtainer told ABC News that purchases from Russian buyers in New York and Miami began to drop precipitously in 2014, when the U.S. imposed economic sanctions on Russia in response to the Russian military incursion into Crimea. Should Trump come out on top in the elections in November, he has said he'll consider whether or not to lift sanctions on Russia. “We’ll be looking at that, yeah we’ll be looking,” Trump responded in July when asked if he would roll sanctions back. Hope Hicks, a spokesperson for the Trump campaign, said the Republican nominee has "never issued a position on the matter one way or another" and reiterated that he would be studying the issue. Trump's children said that if their father becomes president, they would abide by the "blind trust" and not talk business with him. “And we'll act incredibly responsibly and my father already said that he would put the company into a blind trust and it would be run by us,” Ivanka Trump told ABC News last week. Millian said he hopes Trump continues to pursue closer ties between the U.S. and Russia. He recently posted a Trump donation card on his Instagram feed. ABC News' Randy Kreider, Cho Park, and Alex Hosenball contributed to this report.